The new iPad is a fantastic and innovative tool for practically anything, but now you can rely on it for your filmmaking needs as well. It may not be what Spielberg is using to shoot his next blockbuster, however its rapidly becoming a must-have tool for filmmakers of all shapes and sizes around the world. So lets discuss this from the beginning of the production process to the end, and we know where it all starts, the script! Scriptwriting apps such as Final Draft which can be used on both Mac and PC is a popular choice for most scriptwriters. Although the iPad App is only a scaled down version, it offers all the tools required for jotting down, editing and reading, and will seamlessly sync between the tablet and your desktop via Dropbox - which for my money is one of the most helpful features going. Similarly, you also can grab Celtx Script which is a great platform, and totally free. Next step, the storyboard. Planning your sequence of shots is important, and with apps such as Storyboards™ where you plan your storyboard simply with taking pictures from your location research of inspiration. Or if you want to be a little bit more hands on about the process then apps such as Paper is useful, where you have the ability to draw your sketches and save them as PDF files. Clapper boards are a vital part of any shoot, they offer important information about the chosen scene and make continuity flow perfectly. Usually drawn with chalk on a blackboard which is the traditional Hollywood form, but you can still have the clapper board with you when using the iPad. Movie Slate™, the app which allows to show more information that can usually be displayed on a typical board. The beauty of this app is that you can return back and add notes from the scene. The teleprompter is fast becoming a necessary item when shooting a scene. We all are aware how long the battery life is of the iPad and its nice bright clear screen makes it a winning choice to read from. Editors Keys offer The One Take Only iPad on their website retailing at £349.99. There are many teleprompting apps that can be downloaded, Teleprompt+ and ProPrompter which both support external devices such as the iPhone. The iPad can also be used alongside USB microphones such as the Studio Series SL150 and SL300. Its as simple as plugging in and downloading free apps such as GarageBand™ and your on your way! Field monitor you say? Well yes no fear the iPad substitutes as a fantastic field monitor, used with Teradek Cube™ encoder. Incorporating the cameras output which then streams via Wi-Fi to other iOS devices. To do this you must download the Teracentral™ app. This can also be used as a sharing device with your producer or director, as the cube can stream to multiple devices without a router however if you want to share with a variety of devices you will need to setup a Wi-Fi network with a router. Filming in various lighting conditions can be a nuisance however the iPad can work well as a lighting source. Its apparent the iPad has a large screen which can display fantastic light in smaller shots. An app that you can download is Photo Soft Box Pro HD™ which enables you to use your iPad as light shaping device. The app also allows you to control the iPad with your iOS device. Also a word of advice, its most effective if you have the iPad mounted on a tripod or alternatively have an assistant hold it in place. Many feel they don€™t need a timecode for the amount they can be priced at. However the iPad can act as one with the correct cable and correct application. An app such as JumpStart LTC which allows you to set the frame rate easy and start the timecode at the beginning of each clip. Do remember that the device that you have connected the timecode to needs to have its own clock, as an iPad is not reliable enough to act as one. As the iPad has a higher-resolution display than most computer monitors, you may find yourself wishing it had a video input of so you can use it as an external monitor. Air Display™ app is one that you can install to use your iPad as an external monitor. You can also install on your computer (PC or Mac) which will then enable you to stream the video via Wi-Fi. Air Display can be used via Wi-Fi and USB. Remember the output will not be as high quality as when connected via USB, and sometimes the framerate will drop. Its handy to use the iPad for video monitoring however it is better to use for viewing things that arent as sensitive to frame rate changes. Plus it will free up more space on your laptop for high quality video playback. What makes the iPad fantastic is that depending on which software you are working on you can use the multi-touch display which gives a great alternative to a physical control surface. By being able to change the button layouts quickly its great if you need to switch between editing programs. If your editing program accepts MIDI controls then you can choose a variety of different applications. Commonly used MIDI control based programs that work with the iPad are AC-7 Core,V-Control Pro™ and Touch OSC™. You can also film in HD with your iPad, apps like Manual Camera, iMovie and FiLMiC Pro are designed to help make your HD iPad camera even more powerful, giving filmmakers more control over shutter speed and focus distance. 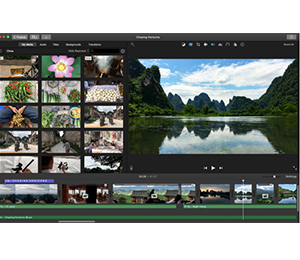 Editing on your iPad never got easier, with iMovie being a top choice for most. Recording and editing sound is also accessible with audio apps such as GarageBand which even allows you to use external USB microphones. And last but certainly not least; the iPad has one of the strongest battery lives going, with the new iPad Pro boasting of a full 10 hours of use time. Needless to say that when your creative juices are flowing the last thing you want to be doing is running around the room looking for somewhere to plug in!